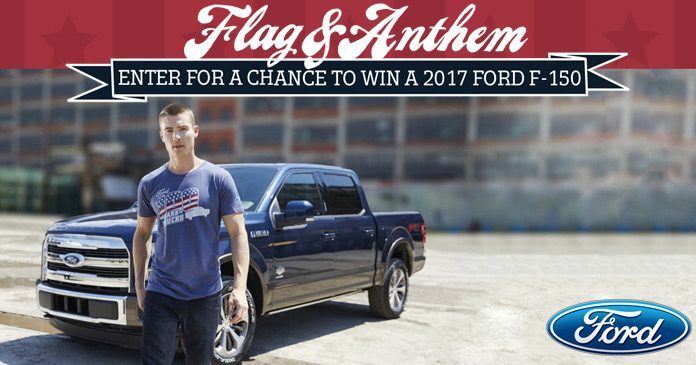 Flag & Anthem Ford Truck Sweepstakes: Win A 2017 Ford F-150! Flag & Anthem and Ford are teaming up to celebrate the 100-Year Anniversary of the Ford Truck with an exclusive menswear collection. Plus, enter the Flag & Anthem Ford Truck Sweepstakes for a chance to win a brand new 2017 Ford F-150. The Sweepstakes is open to legal residents of the forty-eight (48) contiguous United States and the District of Columbia, who are licensed drivers and are age 18 or older at the time of entry. Void in Alaska, Hawaii, Puerto Rico, Guam, the U.S. Virgin Islands, outside the U.S., and wherever else prohibited by law. The Sweepstakes begins at 12:00:01 AM ET on Sunday, August 27, 2017 and ends at 11:59:59 PM ET on Saturday, September 16, 2017. There is a limit of one entry per person, regardless of the method of entry. There is no limit to the number of Bonus Entries an entrant may receive. The winner will be selected in a random drawing on or about Friday, September 29, 2017 from among all eligible entries received during the Sweepstakes Period. There is one Grand Prize available to be won. One Grand Prize winner will receive a 2017 Ford F-150. The ARV of the Grand Prize is $28,000. For a written confirmation of the winner (available after September 29, 2017), send a stamped, self-addressed envelope (no later than October 31, 2017), to: The Flag & Anthem Ford Truck Sweepstakes Winner Confirmation Request, PO Box 25466, Rochester, NY 14625-0466. Flag and Anthem, 214 West 39th Street, New York, NY 10018.
looks like a great opportunity !